Senior consultant at Cook Ross, Inc., Kimberly Rattley is an organizational development specialist who, for more than 20 years, has partnered with clients to bring clarity, focus, and alignment to their diverse teams. She combines her expertise in business, leadership development, diversity, psychodrama, and systems analysis to help her clients competently tackle organizational challenges. Kimberly has an extensive background in academia. At the Uniformed Services University for the Health Sciences, she designed and delivered a national diversity curriculum for military medical providers. Her experiential training methodology was the basis of a five-year research project that validated the power of using a whole-brain teaching methodology to ensure learner engagement and retention. She received a Cosby Fellowship for her research on identity development formation and its importance to individual self-efficacy. Kimberly has a passion for helping people catch a global vision. She has designed more than 100 diversity training curricula for clients including the Applied Physics Lab, Merck, TATA Communications, and the Smithsonian Institution. She coaches senior leadership teams and individuals on the keys to building culturally competent teams. 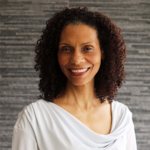 Kimberly holds a Bachelor of Arts from Georgetown University, a Master of Social Work from Howard University, and is certified in the areas of Life Management Facilitation and Organizational Development from Georgetown University.